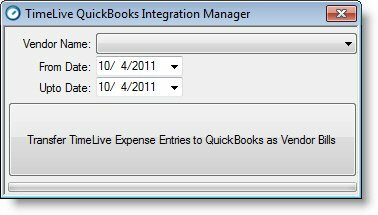 To transfer [Expense Entries] records from TimeLive to QuickBooks as [Vendor Bills], just click on [Transfer TimeLive Expense Entries to QuickBooks as Vendor Bills] button in main option screen of integration tool. Select [Vendor Name] if you want to transfer any selected vendor expense sheet. Just select All, if you want to select time entries of all vendors. Click on [Transfer TimeLive Expense Entries to QuickBooks as Vendor Bills] button.